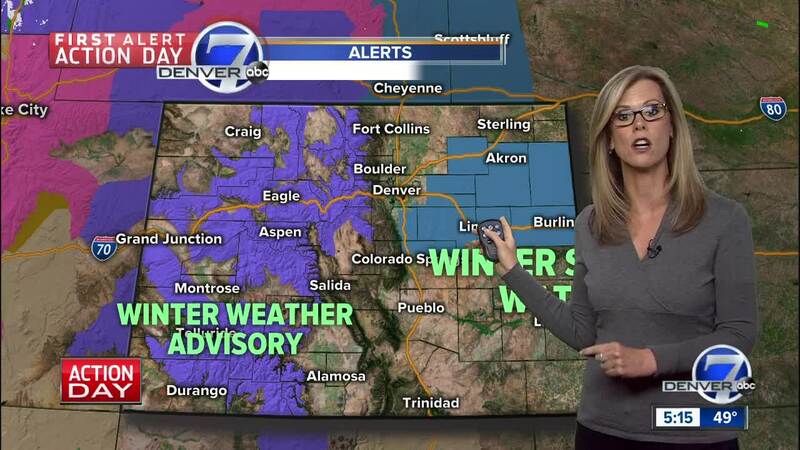 Meteorologist Stacey Donaldson has your latest snow forecast for Sunday night. DENVER — We have issued a First Alert Action Day, as we have snow arriving in Denver starting Monday night into Tuesday morning. The Denver area will be dry and partly to mostly cloudy early Monday. Lows will cool to the 20s and low 30s by daybreak. Monday will start dry across the plains with highs in the 40s and low 50s by mid-afternoon. A few snow showers will begin out west into early Monday morning. Widespread snow is expected to filter into the mountains through the day. A Winter Weather Advisory will be effect tomorrow at noon for the majority of our northern and central mountains for gusty winds and around 4-8 inches of snow. This quick moving front will affect the Front Range and Denver on Monday night into Tuesday with rain changing to snow and temps dropping into the 30s. Rain/snow looks like it will affect the evening commute on Monday (light rain then snow overnight) and morning commute on Tuesday (snow). A Winter Storm Watch has been issued for southern and eastern suburbs around Denver & plains. Snow totals may change as the storm gets closer, but for right now it looks like about 2-3 inches for Denver, 3-6 inches for the plains and 4-8 inches for the mountains. Travel will be tough on Monday night and Tuesday for the I-70 and I-76 corridors east of Denver. Blizzard conditions will be a possibility as winds pick up. Colder weather will follow the storm with highs in the 30s Wednesday. Another front will arrive on Thursday with a chance for light snow or flurries.